WALK ON THE BEACH SEASHELL SUMMER FRONT DOOR WREATH is perfect for a protected front door or as an accent piece for homes with coastal and cottage decor. Designed with Avena, Artemisia, Natural Shells, 2 types of Starfish and Sea Urchins all nestled in Aqua painted Quailbrush Twigs. Perfect gift for a birthday, Mothers Day, House Warming, or just because. 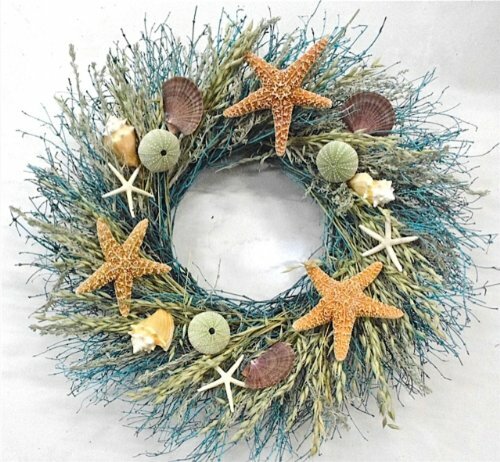 This gorgeous beach wreath measures 21- 22" in diameter and is 6 Inches deep. Use indoors or outdoors - if used outdoors USE ONLY IN WEATHER PROTECTED AREAS - WREATH IS NOT WATERPROOF! SUMMER FRONT DOOR WREATH Beautiful decorative coastal beach wreath designed with Avena, Artemisia, Natural Shells, 2 types of Starfish, Sea Urchins nestled in Aqua painted Quailbrush Twigs. SEASONAL ACCENT PIECE Bring a touch of the beach indoors! Perfect for homes with Coastal or Cottage decor Hang this handmade wreath on a wall, above a fireplace or in your kitchen. OUTDOOR DECORATION May be hung outdoors on a porch, front door or any location that is in a WEATHER PROTECTED AREA. WREATH IS NOT WATERPROOF! HANDMADE IN THE USA These lovely Shell and Starfish Walk On The Beach Wreaths measure 21-22" in diameter, are 6 inches deep and are handcrafted here in the USA. No two wreaths will be exactly the same. EXCELLENT GIFT ITEM For a brithday, Mother's Day, or Housewarming...Or just as a gift to give "just because". Briarwood Lane Coastal Wreath Summer Garden Flag Welcome Nautical Shells 12.5" x 18"
The Beach Is My Happy Place Throw Pillow Case Cushion Cover Decorative 18"